These prices are for dogs attending Daycare or Boarding the same day of bathing service. BRUSH-OUT Quick brush after bath FREE. If difficult brush-out, see services below. Click here to see even more Bath & Spa services. 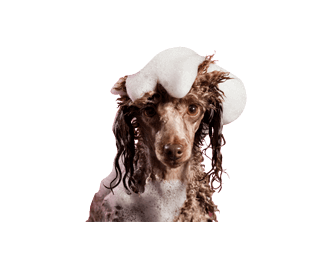 Rescheduling Discount: Receive a 10% discount on your dog’s next Bath & Spa appointment if scheduled within 6 weeks of your previous appointment. Must be scheduled at check-out time to receive discount. Doggy smelling a little “doggie”? 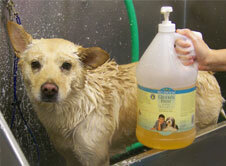 Why not add a bath or other spa service while your dog is here for Daycare or Boarding? Just let us know what extra pampering you’d like for your pooch—bath, nail clip, massage, tooth brushing, coat conditioning. 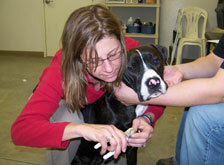 We offer a wide array of spa services for dogs of all sizes. And because you are already using us for Doggie Daycare or Boarding, we offer you prices just a little lower than those for Grooming-Only customers! We use all-natural products in our salon, leaving your dog looking & smelling fresh & clean. Even bath time is fun at Just Dogs! Gentle holds that help reassure dogs can make grooming tasks less stressful!